SANTOS, Elis Gabriela Copa and FERREIRA, Sueli Mara S. P. (2017) 40 years of relationships within the IFLA Latin American and Caribbean section. Paper presented at: IFLA WLIC 2017 – Wrocław, Poland – Libraries. Solidarity. Society. in Session 112 - Poster Sessions. IFLA’s Latin American and Caribbean Section was approved in November, 1974 and two years after, was approved its first Standing Committee (SC). By IFLA rules, any IFLA SC can be composed of up to 25 members, elected for a period of four years or eight. In LAC, these members may come from any of the 41 countries of the region and represent library associations, universities or any kind of library. 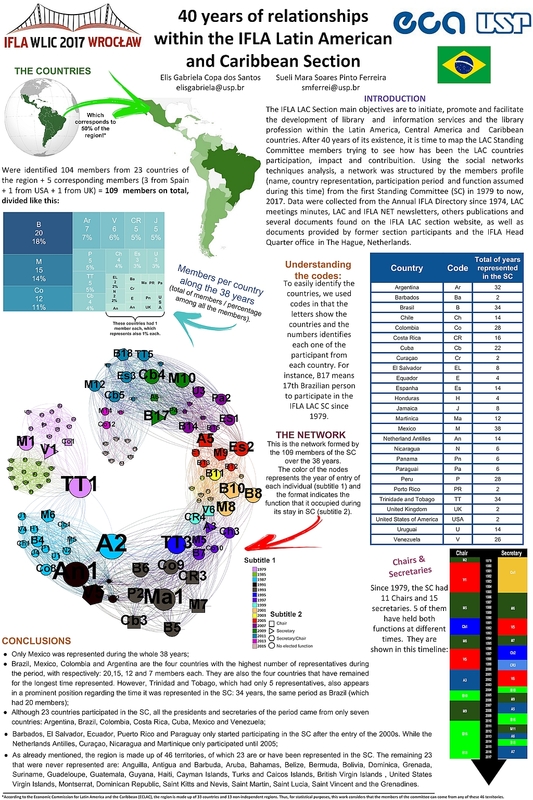 Trying to understanding the impact and penetration of the IFLA LAC Section in individual countries as well as in the region, this project used social network analysis to understand the dynamics of relations built between SC LAC members during the last 40 years. As a result, 73 members representing 23 LAC countries were identified and analyzed. The countries with the biggest number of members are: Brazil(16), Mexico(10), Argentina (6) and Colombia (5). Considering the time each country was represented in the section and the number of representatives of each one, it was expected that the secretaries and presidents of the section would be from the countries with the greatest number of representatives. And the network analysis proved this fact. The presence of members from universities (professors / researchers or university librarians) was massive, and it is interesting to note that there is a great potential for partnerships between IFLA and the academic communities in the region, guaranteeing projects within the scope of the library professionals training.